As a Certified Tahiti Tiare Agent, I had the wonderful privilege and opportunity to travel to French Polynesia for the 1st annual Tiare Agent Conference. The conference was held at the Radisson just outside of Papeete over the course of 2 days, but I was able to visit Huahine, Raiatea, and Tahaa prior to attending the conference. I had the pleasure of traveling with my friend and fellow agent, Caroline, who is also a Certified Tiare Agent. As always, it was an outstanding trip and the information I gathered is invaluable. Getting to Tahiti, at least for me, seems to getting more and more difficult as the years go by. Not that anything has changed since my first trip in 2004, other than me actually moving closer to Los Angeles. For some reason, one or both of my departing flights are always delayed. This time it was both- I was late getting to Los Angeles via Southwest Airlines after an hour delay and then Air Tahiti Nui was delayed by 2 hours leaving Los Angeles. After panic had struck me twice during my journey, thinking I would never arrive, we actually made our interisland connection to Huahine, even if it was only by a minute. The return flights were less eventful and on time. Our first stop was the beautiful Te Tiare Resort in Huahine. This was my first time to the island of Huahine and hopefully, it will not be my last. The island of Huahine is very quiet and laid back, with very little development. So, you get the mountainous beauty of other Society Islands, like Moorea and Bora Bora, but without the large resorts and throngs of tourists. The water isn’t quite as colorful as Moorea and Bora Bora, but in defense of the island, it wasn’t extremely sunny while we were there. So, I need to give it another shot! The Te Tiare Resort is a mid-size resort that is currently managed by South Pacific Management, who also oversees the Pearl Resorts. This transfer of management occurred in late 2008, and since then, many improvements have been made. The resort is only accessible by boat from the village of Fare. They also offer complimentary shuttle rides to and from the resort daily, so that you can spend time on the main island (side note – the main island is actually two islands, connected by a small bridge. The largest island, Huahine Nui, is where the airport and Te Tiare Resort are located.) When you arrive at the resort, you canâ€™t help but notice the gorgeous, well maintained grounds and the beauty of the surrounding land. It’s almost like it’s a tiny hidden gem, tucked away from the rest of the world (well, I guess in a way, it is!) The resort is far from the uber-luxurious resorts found in Bora Bora, that are decked out in marble and have rooms larger than most homes, but it’s very quaint, clean, and it definitely tries to maintain that authentic feel. After all, Huahine is definitely among the most authentic islands in French Polynesia! All categories of bungalows, ranging from garden to deep overwater, have their pros and cons. The garden bungalows, for example, are perched up on a small hill, so they have a nice view, while the beach bungalows have a direct path down to the beach. The lagoon overwater bungalows are only partially over the water, but they still have access to the lagoon for those who prefer shallow water. All of the bungalows are very similar on the inside, though. The rooms definitely benefited from a recent renovation, which included new tile in the bathrooms, new TVs, and new roofs (Side note- one downside is that the new roofs are made of Palmex, which is a synthetic plastic. The reasons for using this material make sense from a cost stand point, and you can hardly notice that it is not natural, but it does make the room a bit warmer.) The deep overwater bungalows, which I stayed in, are the most popular accommodation choice, but there are only 9, so be sure to book ahead if you prefer this type of accommodation. Personally, I felt the snorkeling was marginal around the overwater bungalows, but the view looking out toward the reef is stunning. The Te Tiare has two restaurants, one next to the lobby that serves breakfast and dinner, and one right in between the pool and the beach that serves lunch. The food was good by French Polynesia standards (yummy French fries!) and the staff is extremely friendly. The beach area is very clean and the sand is not powdery soft, but definitely a nice shade of white. The resort keeps canoes and kayaks on the beach for use at any time. The resort can also arrange activities, such as a island tour or care rental, at the front desk. We chose to rent a car through Europcar and we took less than 3 hours to drive around both islands, with several picture stops! (Side note- please keep in mind that only manual transmission cars are available. If you cannot drive a manual transmission car, I recommend doing a jeep tour.) Both islands are beautiful, with stunning bays and volcanic peaks. My only regret is that I only had 2 nights and wanted to do more! (Side note- I recommend at least 3 nights on any island!) One thing, in particular, that I missed is taking a kayak out to the reef just beyond the resort. It’s a 20 minute paddle and the snorkeling is supposed to be fantastic! I definitely recommend Huahine and the Te Tiare Resort, especially to those travelers who may be on a stricter budget. The resort as a whole is a very good value, because you get the exclusivity of a small, private resort, but at a reasonable price. Our next stop was the island of Raiatea, only 15 minutes away by air, and which happens to be the gateway for Tahaa as well (more on that later!). I had only been to Raiatea on my way to Tahaa, so it was nice to spend some time there before moving on. Raiatea is the most sacred island in French Polynesia, with various ancient marae that can be visited by car or on an island tour. Raiatea is also the main port for most boat charters, as it is centrally located between Huahine, Tahaa, and Bora Bora. So, one may consider visiting Raiatea for a night or two when chartering a boat. 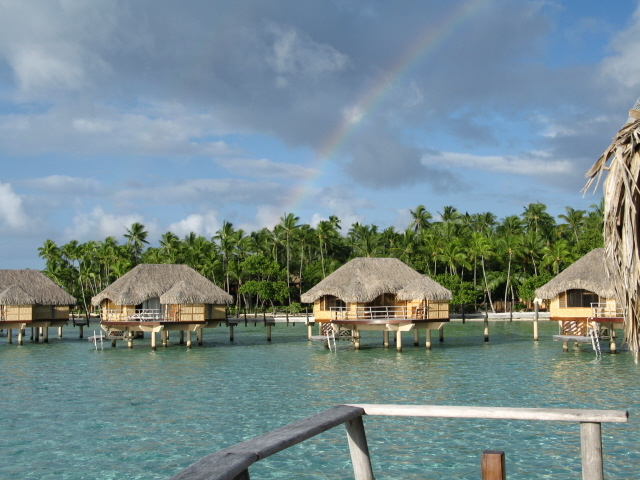 Raiatea, like Huahine, is also very quiet and very laid back, but does not have any major resorts. There are two hotels that are in the 3-4 star category- the new Raiatea Lodge and the Hawaiki Nui. I stayed at the latter for 1 night. The Hawaiki Nui is definitely not a resort and it sits alongside a fairly busy road just outside of the main village of Uturoa. While I canâ€™t count the Hawaiki Nui as one of my favorite places to stay in French Polynesia, there are a lot of good things to point out, such as a very friendly staff, crystal blue water underneath the OWBs that was teeming with fish, access to a private motu off of the main island, and the grounds were very lush. I do have to caveat my opinion, however, by saying that it did rain for our entire stay AND, as I pointed out above, my stay was only 1 night. I truly believe if this hotel was given even a minor facelift, it would be the perfect place to stay for someone who was on a strict budget and wanted an OWB. Also, I should note that the garden bungalows were very nice, with a bathroom/shower that was made to appear as if it were outdoors, but with the privacy of being indoors. It was very unique and a great selling point. The last part of my trip before heading to the conference was spent at my favorite resort, Le Tahaa. I could probably go on for days about this place, so instead of taking up more space, I’ll just refer you to my trip review that I wrote in 2004. My thoughts from that trip remain the same, and if anything, the resort has gotten even better after taking on the Relais and Chateaux branding. I will note that this time I stayed in a Tahaa view OWB, instead of the beach villa. While the OWBs were absolutely amazing in every way, my heart still lies with the beach villas! They also have introduced Royal Beach villas, which actually have two separate rooms within the stone wall. Simply put, they are amazing! Tahaa continues to be a must see.